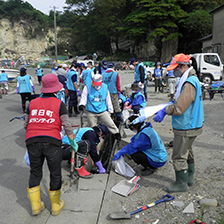 Marubeni remains firmly committed to the ongoing disaster recovery efforts, and will use the knowledge and expertise we have accumulated through our business activities as a general trading company to help the victims of disaster move forward into the future. 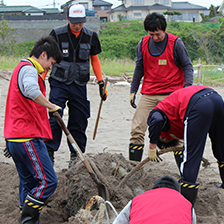 We pray for the quickest possible recovery for disaster-afflicted areas. 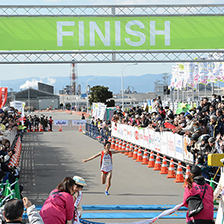 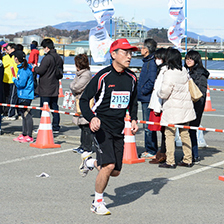 On February 14, 2016, the Marubeni Group sponsored the 7th Iwaki Sunshine Marathon held in Iwaki City, Fukushima Prefecture. 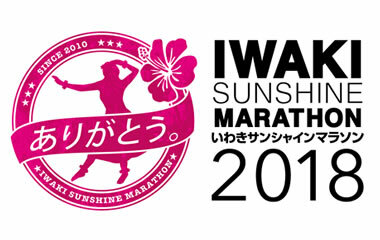 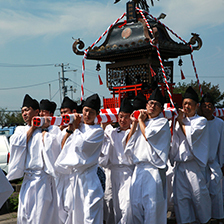 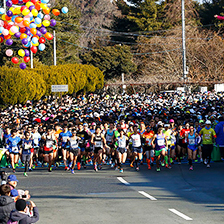 The marathon symbolizes the recovery made by Iwaki City since the Great East Japan Earthquake. 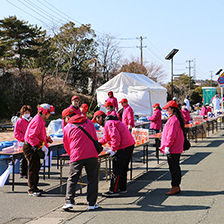 In 2016 approximately 12,000 runners and volunteers participated in the event. 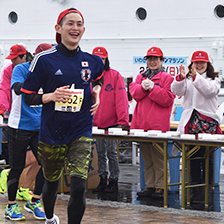 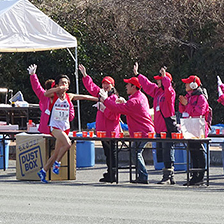 Marubeni, which has a deep business association with Iwaki City, sponsored the marathon for the second consecutive time to support recovery. 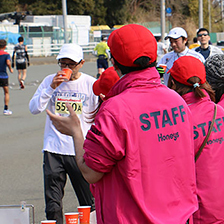 A total of 52 Marubeni Group members, comprised of 26 volunteers and 26 runners, participated in the event. 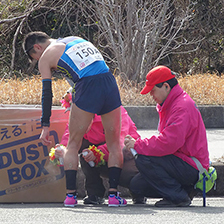 Marubeni Footwear, the exclusive distributor of outdoor brand MERRELL shoes in Japan, as well as two recipients of donations from Marubeni Foundation, set up booths in the sponsor booth area located near the finish line. 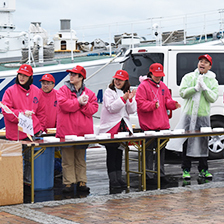 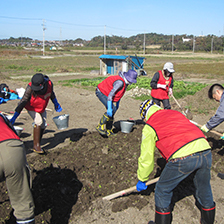 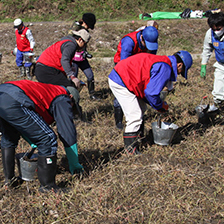 The Marubeni Group continues to dispatch employees to carry out volunteer activities in Shichigahama-machi in Miyagi Prefecture and actively conducts other Great East Japan Earthquake recovery efforts. 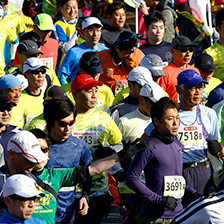 Sponsorship of the Iwaki Sunshine Marathon is one of the many ways in which the Marubeni Group is contributing to the regional recovery of Fukushima Prefecture. 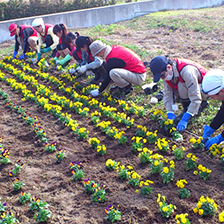 Since June 2011, The Marubeni Group has been making a concerted effort to support the recovery of Shichigahama-machi, Miyagi Prefecture as part of their support of Great East Japan Earthquake recovery efforts. 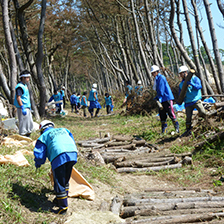 The First Phase was completed in 2013, and the Second Phase is currently underway. 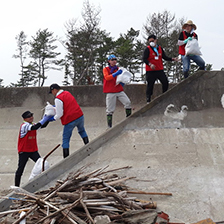 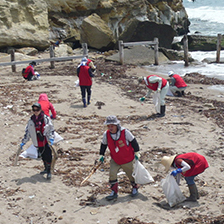 As of March 2017 a total of 790 volunteers have assisted with tasks like clearing of debris and cutting brush and weeds at homes, beaches and farmland. 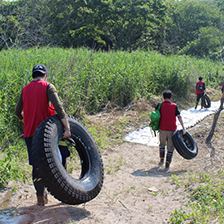 Moving forward, we will continue to participate in activities to respond to the changing needs of the local area based on local communication and interaction that has been developed through past activities.